Today i guided John McHugh from New Jersey and what a difference a few hours made on the fishing. 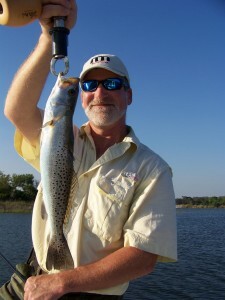 John and i did evening trip and hit fish pretty quick but then the bite came to a screaching hault after some Trout and Redfish hit the deck. We decided to headed further north before the sun went down and that decision resulted in fish,fish and more fish. John is an outstanding angler and a pleasure to fish with. I won’t go in to why this is titled like it is but if you ever see me or John don’t forget to ask about the underwear and we’ll crack you up with a story. John thanks for choosing Lost Bay Guide Servive and i look forward to fishing with you in the future.